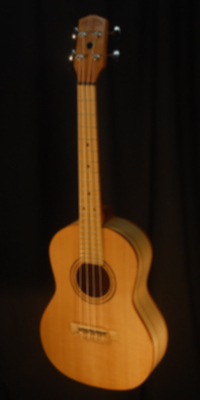 Flat top Ukuleles are available in the three smaller sizes. Tenor, Concert, and Soprano. The style of the rosette, binding and other ornamentation is easily customizable per order. Back and sides can be made from a variety of hardwoods with appearance as well as tonal response being considerations in the selection.Tops can be hardwood as used in the traditional instruments as well as Softwood such as cedar or spruce as is increasingly used on contemporary instruments. This example has Curly Ash back, sides, and cherry neck. The top is fan braced Sitka Spruce. The fingerboard is Black Locust. The headstock is Black cherry. This example has Black cherry back, sides, and neck.